JLM﻿﻿﻿﻿Connects ﻿the missing "Peace" in your circle of life. We are passionate about good old fashioned care, and affordability is key to what we offer. No need to contact expensive alternatives. We help people in many different ways. During life people may need a helping hand in structuring finances, sorting out paperwork, selling / buying/clearing a house through to Mortgage and Investment help. We assist you to set up Lasting Power Of Attorneys so that only people you trust can make decisions on your behalf, if you become unable to. Something we should all have in place. Please see our Lasting Power of Attorney page to learn more. At the end of Life we all want to know that our family will be safe and secure. 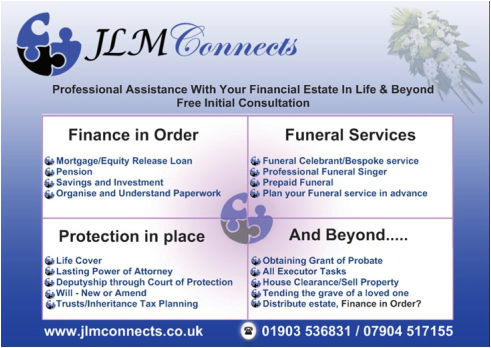 Julie is a qualified Funeral Celebrant, passionate about providing a funeral service which is right for the deceased. If you are someone who knows their life journey is going to end in the near future please contact us. End of Life Conversation is not a taboo subject with ourselves. Please see our Funeral Celebrant page to learn more.. Beyond Life, families often need a helping hand to sort out a loved one's estate. We assist with every step, not just probate application paperwork. We keep clients regularly advised of progress throughout any assistance we provide, thus giving peace of mind that all is proceeding smoothly. ​All done at affordable cost. Please see our Probate page to learn more. We offer face to face confidential meetings at a venue of your choice.. The first meeting is always free. We work mainly in Sussex, but are happy to extend the distance when required. Easing worry through difficult and challenging times, we provide care, respect, and peace of mind for Life & Beyond. We are pleased to assist you. Please see our services page for a growing list of other services we offer. ﻿We are proud to receive recommendation and feedback from our clients which you can view on our testimonial page. Our services have been approved and are available on shop4support.